Purchased in 1994, this ambulance is equipped with advanced life saving tools. 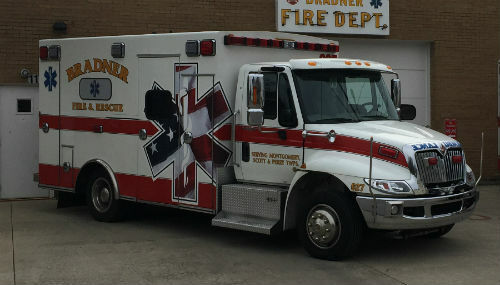 Purchased for $225,000, and replaced the 1981 and 1979 ambulances that the village had used, this ambulance is used for EMS runs within and surrounding the Village of Bradner. 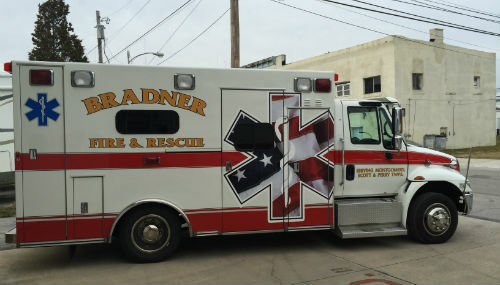 Purchased in 2014 for $270,000, this ambulance is also used for EMS runs within and surrounding the Village of Bradner, and is equipped with the same life saving tools as Medic 626. Purchased in 2001 for $267,000, this engine has a 1,500 gallon per minute pump that carries 500 gallons of water. It contains a 9,000 watt hydraulic generator with a 6,000 watt light tower and carries extraction equipment for vehicle accidents with entrapment. This engine can carry 10 personnel to emergency situations. Purchased in 2009 for $360,000, this engine also has a 1,500 gallon a minute pump, like Engine 621; however, it is set up strictly for fires and carries 6 personnel on board. This engine has a 12,000 watt hydraulic generator and a 9,000 watt light tower. Still used today, this tanker truck is used to deliver water to structure fires and holds up to 2,000 gallons of water. On April 13, 1929, the village council voted to purchase a 1929 Model A Ford fire truck from the Prospect Fire Equipment Company for $3,000. The truck was a deluge triple combination pumper, chemical and hose truck. The pump capacity was 300 gallons per minute at 120 pound pressure. The truck was delivered June 11, 1929. This was the village’s first motorized vehicle and it is still owned by the village and maintained by the fire department today. Copyright © 2018 Bradner Fire and EMS Department. All rights reserved.